66-acres of spectacular beautiful gardens displaying incredible seasonal flowers, ornamental shrubs, trees plants and more, set on White Rock Lakes serene shore. One of the most beautiful attractions in Dallas, The Dallas Arboretum is 66-acres of spectacular beautiful gardens displaying incredible seasonal flowers, ornamental shrubs, trees and collections of plants set on White Rock Lakes serene shore. We host seasonal outdoor festivals, concerts, art shows and more year round. Our guests enjoy both indoor and outdoor dining in either Restaurant DeGolyer in our historic DeGolyer House or on the Lula Mae Slaughter Dining Terrace overlooking the downtown area of Dallas. Come and enjoy making memories with friends and family. All ages come to enjoy year-round education programs on gardening, art, hands-on science, and the gardens offer plenty of outdoor exploration opportunities. The Dallas Arboretum is world-famous for its beauty, and chosen by many brides for their weddings and receptions. 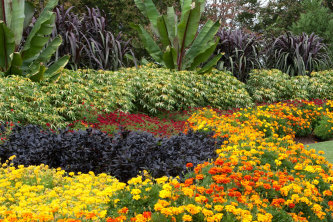 Every season is something new at The Dallas Arboretum.